Join the Club—for FREE! Our English club is open to everyone and is free of charge. These fun gatherings are open to current students, alumni, and to those in the community who are looking for an opportunity to practice speaking in English. Those who want to practice speaking English. * Note: To participate in Café Club, you must have completed Standard X. 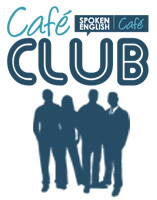 Each Café Club is two hours in length and is open to Café students and people* in the community. Check this page for the next he Café Club meeting. The Café Club features fun activities to help build conversational ability.